Dear President Pranab Mukherjee, it feels good to see your concern over the imminent threat of food insecurity because of the degradation of large masses of agricultural land. Your insistence upon the urgent need to adopt more sustainable methods of land use systems and soil management practices is really important and must be acted upon. Your concerns are real, Mr. President. But, are they as real and urgent for the millions of citizens of India who hit their beds, or the footpaths, with empty stomachs every night? Not that you are unaware of their existence. You, after all, are one of the few politicians in India who have cared to recall them even after winning an election and not only during electioneering. Memory has it that in your acceptance speech, after becoming the President of India, you mentioned hunger being the biggest humiliation for a country that dreams of becoming a superpower, Mr. President. You remembered the hungry millions while making the sustainable land use argument too. At that time you asserted that India being ranked 80th out of 104 countries in the Global Hunger Index 2015 is something unacceptable. You could have asked yourself whether the millions, due to whom India is ranked so low, are hungry because of lack of availability of food, or whether there is some other reason. The answer is a resounding no Mr. President. And, arriving at this answer may have helped you fully confront that these millions live in a country where food grains rot in godowns of the Food Corporation of India every year. The amount of foodgrains lost in the face of such widespread hunger should be as big a humiliation to the nation as hunger itself, Mr. President. FCI’s reply to a right to information query from a media house put the food grains lost at 24,695.45 tonnes in 2013-14 alone. Take all of the food grains lost from 2010 and that comes to a total of 56,000 tonnes. 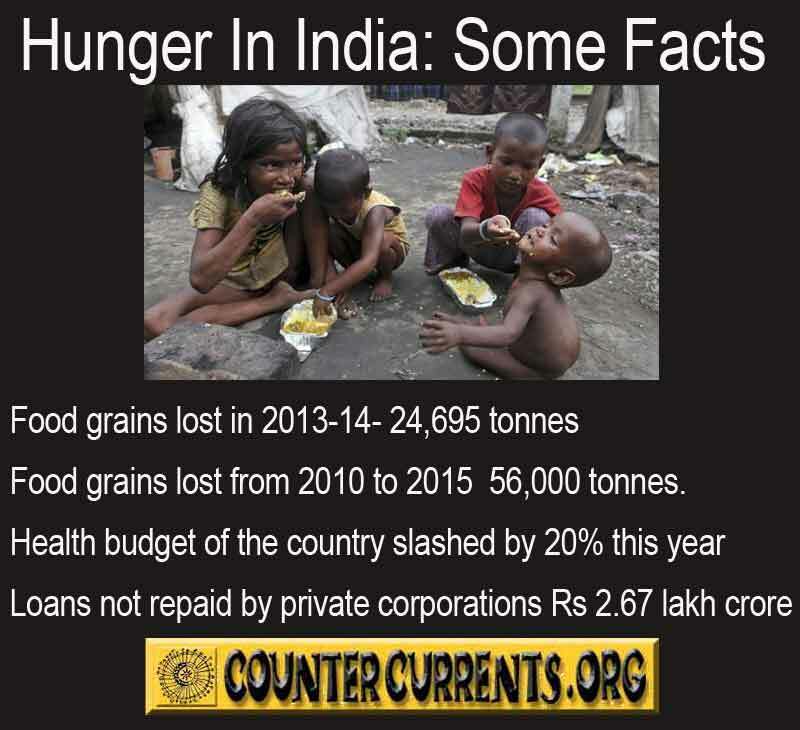 Lack of food cannot be the reason behind the hunger that plagues India right now, can it? The real and immediate reason behind hunger that is endemic to India, Mr. President, is the failure of welfare schemes of both the central and provincial governments. Most of these schemes never deliver to the intended beneficiaries. The benefits are stolen in one way or another by those supposed to implement the schemes. And this is not a lament of yet another human rights advocate, Mr. President. This is what the Supreme Court of India criticised the Government of India for. "All the ideas you have seems [sic] OK. Government of India has wonderful laws, ideas and schemes but the things are different on the ground". This is what a social justice bench of the Supreme Court of India, comprising justices Madan B. Lokur and U.U. Lalit, had curtly told Additional Solicitor General Tushar Mehta when he informed the Court about the schemes which the government had formulated for the welfare of children. This, unfortunately, is true not only for schemes meant for children; it is a universal truth for all the welfare schemes. Sadly, the failure of implementation of welfare schemes is not the only thing that contributes to perpetuate hunger in the country, Mr. President. Serious attacks on such schemes and other entitlements in the recent past have also threatened to offset whatever small gains the country had made in the last decade. Mr. President, you must be aware that the health budget of the country has got slashed by 20% this year. This happened despite the draft of the government’s own national health policy asserting that “catastrophic” expenditure on healthcare neutralizes any gains made by rise in income and social welfare benefits targeted to reduce poverty, and forces 63 million Indians to face poverty every year. This happens, also, despite other studies estimating the death of children less than 5 years of age due to malnutrition related causes at more than a million. A UNICEF study, for instance, asserted that these high numbers cross the emergency threshold guidelines of the World Health Organisation and require the Government of India to recognise acute malnutrition as a medical emergency. The government, your government to be precise, Mr. President, did not declare a war on malnutrition. Rather, it has reduced its contribution in funding of 17 centrally sponsored social sector schemes to a 60:40 ratio, a move that will certainly affect the poor adversely. The schemes affected, Mr. President, include the Mid-Day Meal scheme that has successfully brought down malnutrition among children and dropout rates. These attacks, Mr. President, which treat entitlements as wasteful doles that can be done away with, keep India ranked at unacceptably low positions in hunger surveys. Dealing with the investments in social security of the citizens is as crucial a key to development as encouraging entrepreneurship and investments in economy. The country will be doomed to remain humiliated by hunger if it fails to recognize this. On a different note, Mr. President, non performing assets – a major chunk of which are loans not repaid by private corporations – have increased to Rs 2.67 lakh crore at the end of March 2015, from Rs 2.16 lakh crore a year ago, as per the information shared in Parliament by the Minister of State for Finance. Those, perhaps, are the real wasteful doles that should be recovered and put into the social sector.